The Nile is the longest river in the world, coursing about 6,650 kilometers (4,132 miles) across northeastern Africa to meet the Mediterranean Sea at the broad, green delta in Egypt. The Nile’s drainage basin extends roughly about 1.3 million square mile (3.34 sq km) and includes parts of Tanzania, Burundi, Rwanda, the Democratic Republic of the Congo, Kenya, Uganda, South Sudan, Ethiopia, Sudan, and Egypt. As the waters pass through some of the driest desert on Earth, the river’s importance as a source of food, water, transportation – and even life – cannot be underestimated. 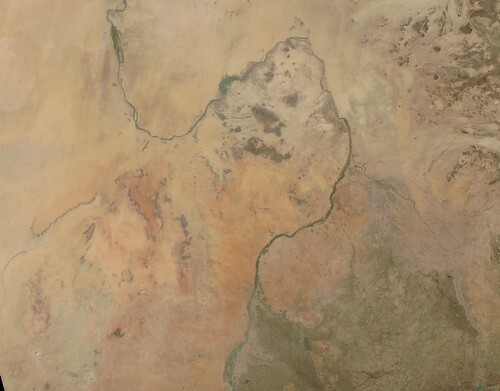 On March 15, 2019, the Moderate Resolution Imaging Spectroradiometer (MODIS) on board NASA’s Terra satellite acquired a true-color image of the Nile River as it weaves through Sudan. The Nile begins where two tributaries, the White Nile (west) and the Blue Nile (east) meet at the large city of Khartoum. This confluence can be seen in the lower center of the image. From Khartoum the river snakes to the north and west, reaching the extremely arid Sahara Desert. Most settlements in Sudan are along the Nile and in the greener, moister regions between the Blue Nile and White Nile.